Restaurants : Beach Club, Ventuno Ristorante and Cafe, Java Coast, Hamada of Japan, Steakhouse 46, Jimy Buffet's Margaritaville, Paradise Garden Buffet, Tropical Breeze. 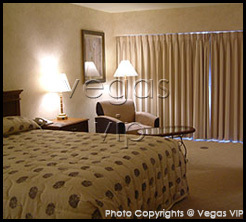 Standard room amenities : Air conditioning, alarm clock, cable TV, desk, electronic door locks, hair dryer, in-room safe, iron and ironing board, on-command movies, radio, telephone with voice mail. Hotel amenities : Tennis Club, Dollar-Rent-a-Car, beauty salon and barber shop, concierge, currency exchange, luggage service, maid service, safety deposit box, wake-up call. With ties to Bugsy Siegel and the mob scene of the 1940's era, the Flamingo hotel has a history as colorful as its property's aesthetic look. Although Bugsy Siegel is unfairly credited with creating the Flamingo and the Las Vegas Strip itself, he did have a big part in it. He took a project that was headed downhill and 'funded' its recovery with his money. 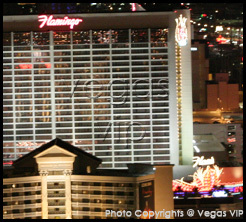 Now stand the gorgeous Flamingo Las Vegas with its gardens and pool and now bustling entertainment lineup. The lush gardens behind the room towers seem to remove the visitors from the Strip entirely, with live African penguins, Chilean flamingos, Mandarin ducks and Koi fish swimming in ponds and under the three-story waterfalls. 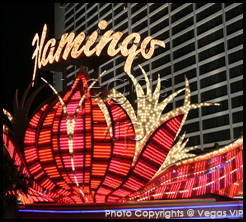 With tennis courts, top-rated swimming pools and a world-class health, the Flamingo helped popularize the notion of resort as opposed to casino. Flamingo Hotel's Restaurants cater to tastes ranging from Italian to Chinese, and the Paradise Garden Buffet serves up delicious food in a relaxing setting. Entertainment has just heated up with the addition of Toni Braxton as a headliner, in addition to the ever-popular Second City comedy troupe.